I wish I had a dollar for every time I’ve been asked what tools I use to trade. It would be easy money because my answer is always the same: chart patterns and volume. Price movement tells us how “frisky” a stock is, and volume tells us how committed traders and investors are to buying or selling it. Chart patterns tell us when the big moves are getting ready to happen. Traders in my chat rooms often complain that a large number of stocks have moved on lower volumes. What many may not understand is that volume tends to show up at the beginning and the end of trends. During periods of consolidation, volume generally drops. Rising volume tells us when buyers or sellers are coming into a stock. So when is volume most important? Volume matters on breakouts (or breakdowns) from a consolidation like a bull flag or cup and handle pattern. When a stock leaves a range, volume provides a measure of buyer commitment to that move. When a fast moving stock rises on 200% of its average daily volume for example, I make sure it’s on my watchlist! There is a general rule in trading that a stock moving up on light volume is considered bearish since it shows lack of buyer commitment. The opposite can be said about a stock moving down on low volume – it shows limited selling interest and is therefore bullish. What I need to see before entering a trade is a move in either direction accompanied by large volume. 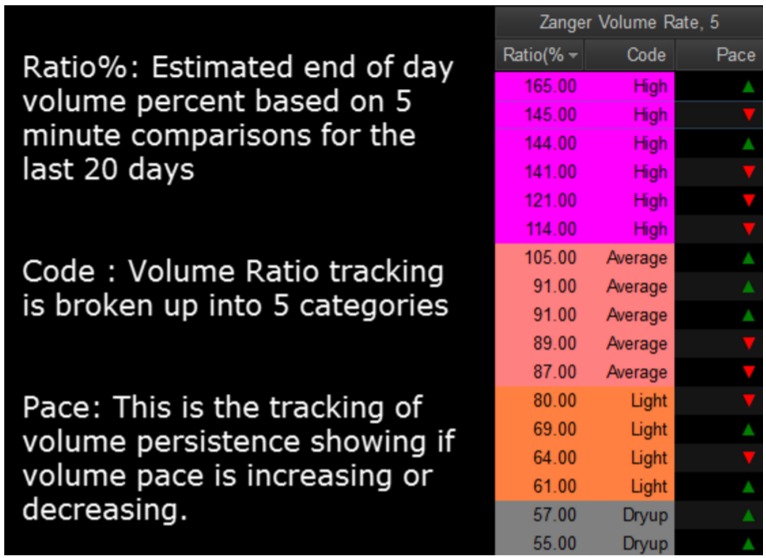 Given the importance volume plays in stock movements, I created an indicator called the Zanger Volume Ratio (ZVR). 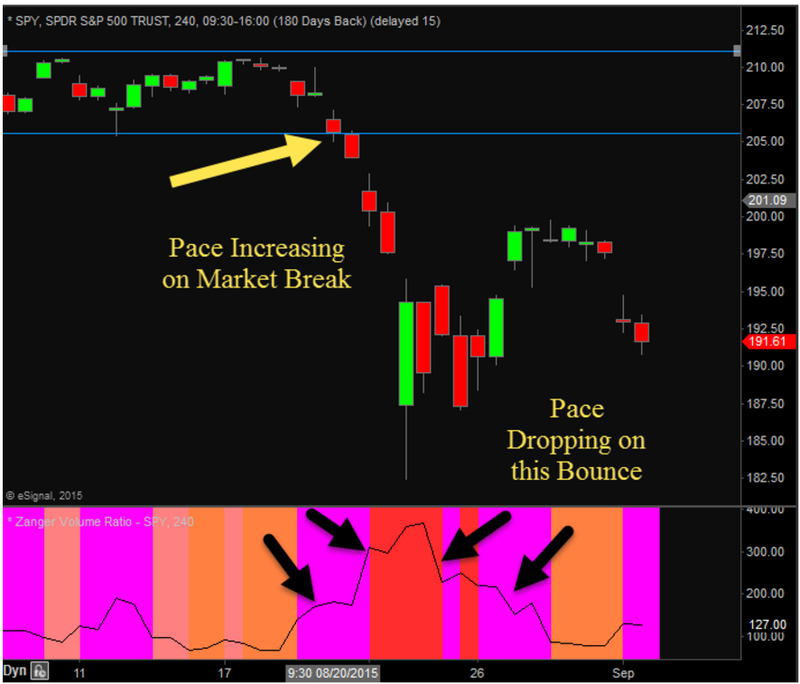 In this article I outline how it works and how it has helped traders anticipate the strength of stock price movements. In a nutshell, heavy volume action often precedes big moves! As we see in Figure 1 & 2, the ZVR is color coded to make it easier to read in an instant. Red shows extreme levels of volume, purple indicates high levels and gray at the other end of the scale shows extremely low volume. In Figure 2, we see examples of 30-period volumes expressed as in percent of average daily volumes. If you are looking at a daily chart, that is the percentage volume of the past 30-days. A volume ratio of 165 means the stock is trading 1.65 times or 165% of average daily volume which is high. As we see in Figure 3, Intrexon (XON) went from trading on very low dry-up volume on the left-side of the chart (gray in the lower volume sub-graph) but then volume started to ramp up from light (orange) to high volume (purple). But note what happened on the big move from $46 to $52 as the stock formed the pole of the bull flag pattern and the consolidation that followed. Volume jumped to more than 200% of average daily volume and the ZVR turned red. Also notice that as soon as the flag is finished forming on the 16th, volume hits another extreme level as XON makes another big move up from $51 to $57. Figure 4 shows an example on a bearish move. Note what happens with the SPDR S&P500 (SPY) ETF breaks through the bottom blue support line. Selling volume rises to above average (purple) as it gaps lower but then rises to extremes (red) on the bounce back (big green candle). But on the following days, selling resumes at either high or extreme levels, which is bearish. As Einstein once said, “Everything should be made as simple as possible, but not simpler.” The same is certainly true about trading. Broken down to basics, trading is about price and volume. Everything else is just noise. Trying to trade without using volume is like trying to drive a few hundred miles without putting gas in your tank. Trying to trade without chart patterns is like leaving without having an idea how to get there!